Location: South side of a bend in Pilkington Way (A665). Hutchins Way runs through the station site at a lower level. The station site continued to the south of Hutchins Way. 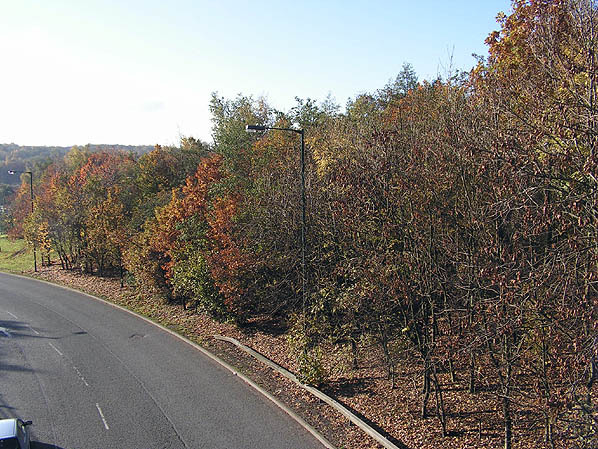 This is now a wooded area but levels have been changed during adjacent landscaping. Present state: Demolished - no evidence remains. The site is largely lost under new roads and landscaping. Notes: Radcliffe Bridge station was on the East Lancashire Railway’s (ELR) Clifton Junction to Accrington line which had opened in stages between September 1846 and August 1848. At first the idea was for a line between Clifton Junction and Rawtenstall via Bury which was discussed at a meeting on 24th September 1843, the outcome being the creation of the Manchester, Bury & Rossendale Railway (MB&RR). This company was formally incorporated on 4th July 1844. While construction was under way another company, the Blackburn, Bury, Accrington & Colne Extension Railway (BBACER), proposed to build a line between Stubbins, which lay to the north of Ramsbottom, and Accrington. The aims of the two companies were so aligned that on 21st July 1845 the companies merged as the East Lancashire Railway. local industries – principally bleaching, cotton spinning and weaving and coal mining – caused their populations to swell. Radcliffe Bridge station was located just to the north of the River Irwell, between Sion Street and Green Street. The line was double-track so the station was provided with two platforms. The main station building was east of the line on the southbound platform. It was a single-storey stone building with paired, round-headed windows. The hipped slate roof extended a short distance over the platform to form an awning; there was a plain wooden valance at the front and crenellations at either side. A similar roof overhang provided shelter over the entrance on the opposite side of the building. The northbound platform was provided with an enclosed, glazed wooden shelter, also with a slate hipped roof. On the west side of the line adjacent to the station was its goods yard; although only a small yard it had a 10-ton crane. The east wall of the goods shed was parallel to, and at the back of, the northbound platform. Sidings accessed from the goods yard served Allen's Green Colliery to the west of the station. The colliery had closed by the early years of the 20th century and the sidings were lifted. 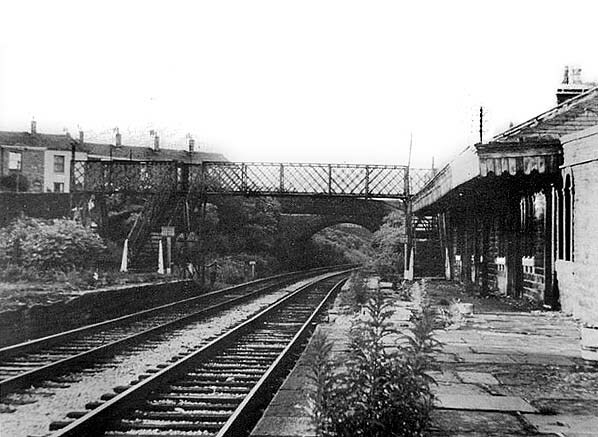 Prior to 1905 a lattice-pattern footbridge was installed at the northern end of the station, connecting the platforms, but there was also a span crossing the line leading to the goods shed, enabling passengers to gain access directly from west of the station to the main building with its booking office on the Manchester-bound platform. South of the station was the timber viaduct that carried the line over the River Irwell. At the time of opening five passenger trains ran on weekdays in each direction between Manchester and Rawtenstall; there were four trains on Sundays. On 17th August 1848 the ELR opened a route from Stubbins to Accrington. This created the main line from Clifton Junction to Accrington and reduced the Stubbins to Rawtenstall section to the status of a branch line which on 27th March 1848 was extended northwards to Waterfoot, and some four years later, on 1st October1852, to Bacup. With the opening of the Accrington line Radcliffe Bridge was also served by trains running between Colne and Manchester Victoria. By 1849 there were seven weekday trains to Colne, and six to Manchester which originated at Colne. Four services ran to Colne on Sundays and three to Manchester from Colne. A major source of revenue at Radcliffe Bridge was the movement of cattle which were removed from trains in the goods yard and then herded through the town to the abattoir. On 13th May 1859 the Lancashire & Yorkshire Railway (LYR) absorbed the ELR. The LYR started to use the route through Radcliffe Bridge as an alternative to its congested main line between Manchester and Leeds which brought much extra traffic. The LYR also routed much of its holiday traffic through the station. Prestwich. From its opening most local services from the north, including all of those from Bacup, used the Prestwich line, and therefore the new Radcliffe station, rather than the route via Clifton Junction. Accrington line trains continued to use Radcliffe Bridge. Local people began to refer to Radcliffe Bridge as Radcliffe ‘old station’ after 1879. In 1881 the LYR replaced the wooden viaduct that crossed the Irwell with a new structure; this had four brick piers on which stood five wooden arches. It was built by the contractor Andrew Handyside for £4,225. North Western Railway (LNWR). One year later, on 1st January 1923, the LNWR became a constituent of the London Midland & Scottish Railway (LMS). In 1923 the LMS replaced the wooden arches and decking on the bridge over the River Irwell with a steel structure. The LMS summer timetable for 1932 showed ten northbound trains called at the station, the first being the 05:38 am departure for Colne. The last service was also for Colne and departed at 8:23 pm. In the southbound direction there were eleven trains all of which went to Manchester Victoria; the first departed at 05:20 am and the last at 9:22 pm. Many more passenger services simply passed through the station. Radcliffe Bridge did not benefit as it had long ceased to be the town’s main station, and it closed to passengers on 7th July 1958. Passenger and goods services continued to pass through the station site until 3rd December 1966. With effect from 5th December 1966 the line was closed, and it was lifted shortly afterwards. The station site was subsequently lost under a road improvement scheme. 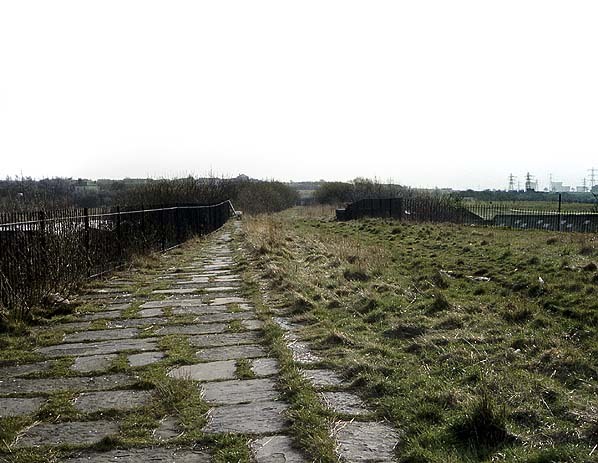 The former railway bridge over the Irwell is extant but fenced off and disused. The course of the line from Radcliffe to near Clifton Junction is now a 4km footpath and cycleway known as the Outwood Trail. 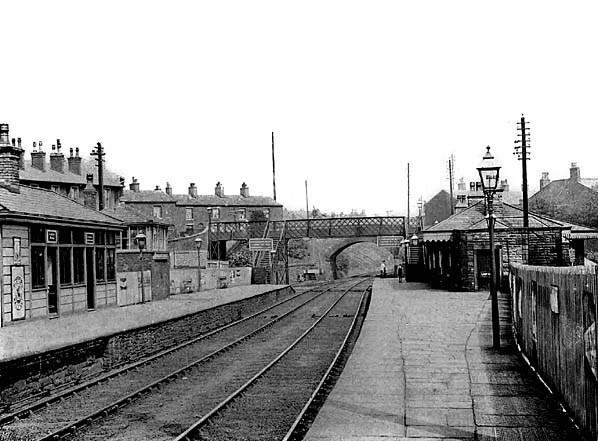 Looking north along the southbound platform at Radcliffe Bridge station in the early part of the 20th Century. To the right is the main station building and beyond it a footbridge which provided access to the northbound platform. The northbound platform can be seen to the left. It had wooden waiting facilities and at this date a signalbox in the centre of the platform. Looking south from Radcliffe Bridge station along the route of the line towards Clifton Junction in April 1984. Part of the platform could still be seen at this date. 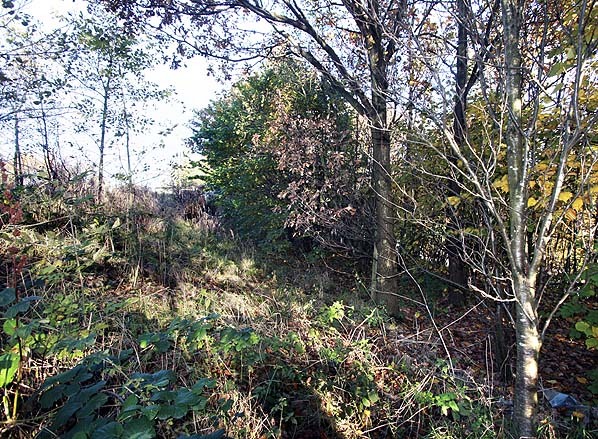 looking south at the site of Radcliffe Bridge Station in November 2010. The north end of the station site has been completely lost under a road and its associated landscaping. Looking north from the south end of Radcliffe Bridge station in November 2010 Although this part of the station site has not been built on levels have changed during the landscaping for adjacent new roads.